Robert H. Sheinberg, D.P.M, D.A.B.F.A.S., F.A.C.F.A.S. A stress fracture is defined as a hairline crack in a specific bone, which is a result of excessive stress in a particular area of the lower extremity. There are three types of stress fractures commonly encountered in the lower extremity. Overuse Injury: Overuse injuries are the most common type of stress fracture encountered in our practice. This type of stress fracture occurs due to overuse and increase in demand on a particular bone in the lower extremity. An overuse stress fracture either occurs in athletes (i.e. running, aerobics) who consistently place stress in a particular area of the lower extremity until the bone fatigues due to over demand or when an individual begins a particular exercise (i.e. walking) and begins to place stress in a particular area that has not been properly conditioned. These types of stress fractures usually occur in the metatarsal bones in the forefoot, in the heel bone and in the tibia (leg bone). Structural Deformity: Stress fractures due to structural deformities are more common in the tibia and second metatarsal. When the ankle has an inner twist (varus) the talus in the ankle hits the tibia and causes a small crack. This crack if untreated can lead to a displaced fracture and arthritis to the ankle joint. Second metatarsal stress fractures can also occur when the metatarsal itself is very long and associated with a bunion deformity. The long second metatarsal takes on more of its share of body weight and cracks can develop, especially in an unconditioned athlete or when performing an exercise that a person is unaccustomed to over a period of days. They can also occur in women who wear high-heeled shoes who are not accustomed to it and put stress on the second metatarsal bone. Pathological Stress Fractures: These types of stress fractures occur due to an underlying bone condition causing weakness to the bone, which may eventually result in a stress fracture due to the bone’s inadequacy to support daily activities. Individuals with osteoporosis most commonly encounter these types of stress fractures. Other systemic conditions and certain medications can also cause demineralization of bone, which predisposes an individual to a stress fracture. On rare occasions a bone tumor may be present, which may also result in a pathologic stress fracture of a bone. Symptoms: The most common symptom is a dull aching type pain well localized to a specific area in the lower extremity. The condition is usually exacerbated by increase in weightbearing and walking type activities. Pain is decreased with rest and decrease in activity level. Onset of symptoms is usually gradual and nonspecific. Often when unrecognized, individuals may experience compensatory pain in other areas, trying to avoid the area of initial pain. Signs: Pain with direct pressure to the area as well as with ambulation. Pain is worse with increase in activities and decreases with rest and decrease in activities. Local swelling with mild discoloration to the area may be seen. When it occurs early it may be subtle. However, when the bone is fracturing the swelling and the pain increase. X-rays: Initially x-ray findings are negative and diagnosis is made on the patient’s history and the physician’s clinical evaluation. Radiographic signs of a stress fracture may not appear for up to 21 days after the initial onset of symptoms. When fracture callus develops it is easily seen on the x-ray and is an indication that the fracture is healing. The best course of treatment depends on where the fracture has developed. Metatarsal stress fractures can usually be treated with a boot that goes up to the knee. This may allow the patient to walk pain free during the healing process. 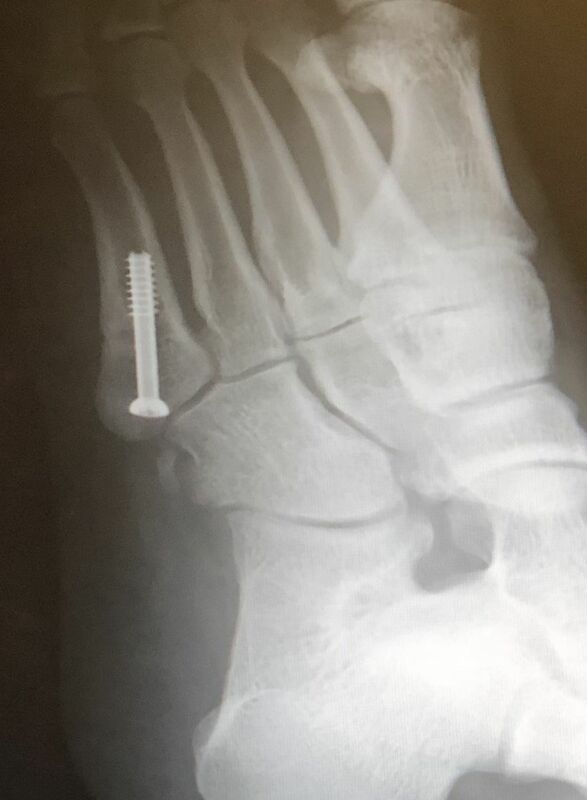 If the stress fracture is to the central of the bone, this is called a diaphyseal stress fracture and this may require cast immobilization and crutches for six weeks until the fracture heals. Failure to do so may cause the bone to heal in a crooked (malunion) fashion. Tibia stress fractures in most cases will require immobilization in a cast or boot and crutches. Stress fractures in the tibia may require a prolonged period of immobilization until the fracture heals. CT scans may be necessary during the healing process to evaluate the healing of the bone. Tibia stress fractures may necessitate the use of a bone stimulator to help improve healing. They may also take 3-6 months to heal. Failure to heal may require an intramedullary nail of the tibia to allow the bone to heal and get the athlete back in their sport. Fibular stress fractures will usually heal uneventfully in 6 weeks. Immobilization in a boot may be all that is necessary and weightbearing can begin immediately. If weightbearing is uncomfortable, then crutches may be necessary for a short period of time. These fractures usually take 6-8 weeks to heal. 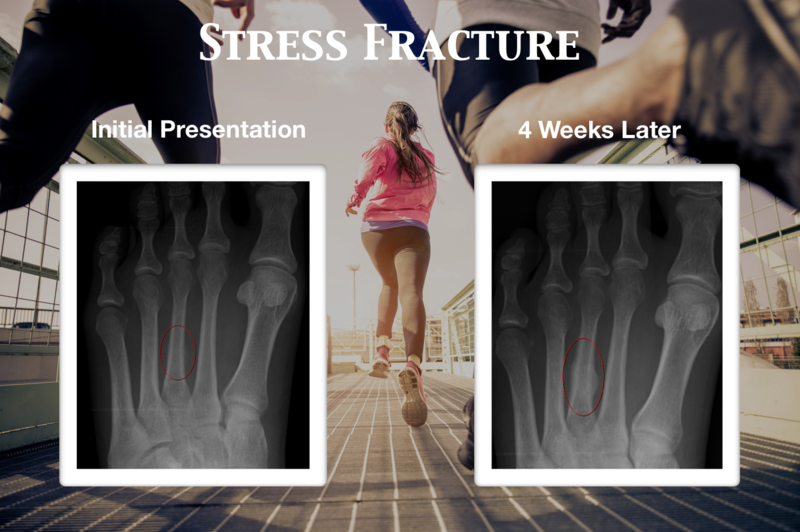 Medial malleolar stress fractures can occur and if they travel into the joint may necessitate cast immobilization and crutches until the fracture heals. This may take 6-12 weeks depending on the time of presentation to the doctor’s office. In some cases these fractures can be chronic, which may necessitate a small surgical procedure to remove hard sclerotic totally vascularized bone. 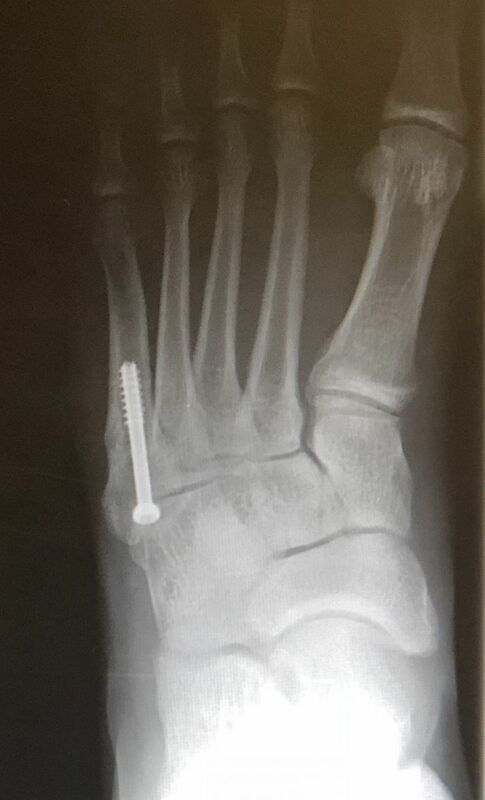 Screws are then placed to compress the fracture and allow it to heal. In some cases we are above to perform this arthroscopically with the screws applied percutaneously. Prognosis is usually excellent.